This is a beautifully written, insightful book about menarche - the first menstrual cycle - and its effect on a young girl's spiritual journey from maidenhood to motherhood. Author Kristi Meisenbach Boylan outlines the seven rituals, or stepping stones, that a young girl faces during her voyage through adolescence. "Tells the truth about both the pain and joy of the adolescent girl's coming of age." ""The Seven Sacred Rites of Menarche" is one of those rare books that can change lives. 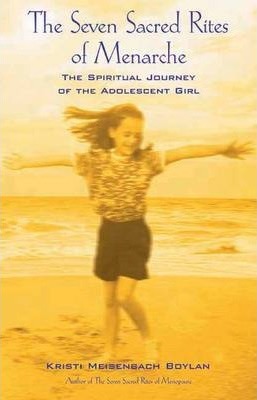 Kristi Meisenbach Boylan writes with an amazing degree of sensitivity and insight about a young girl's struggle with the physical and spiritual changes that come with adolescence. Anyone who is raising a daughter should read this book!" --Michael Gurian, author, "The Wonder of Girls" and "Boys and Girls Learn Differently!" ""The Seven Sacred Rites of Menarche" is pure magic. Kristi Boylan tells the truth about both the pain and joy of the adolescent girl's coming of age. And she also provides us with a remarkable blueprint for honoring and nurturing a girl's spirit through the process, so that she stands a far better chance of growing into a strong and healthy woman." --Christiane Northrup, author, "Women's Bodies, Women's Wisdom" and "The Wisdom of Menopause"
Kristi Meisenbach Boylan is the former publisher of The Parent Track magazine. She began writing about women's issues and the relationship between spiritual growth and fluctuating hormones after her own menopausal transformation, resulting in the widely praised The Seven Sacred Rites of Menopause. For The Seven Sacred Rites of Menarche, Meisenbach Boylan drew upon her experiences as the mother of a twelve-year-old girl. She lives in Richardson, Texas.